Meet Featured Artist, Linda Calvert Jacobson! 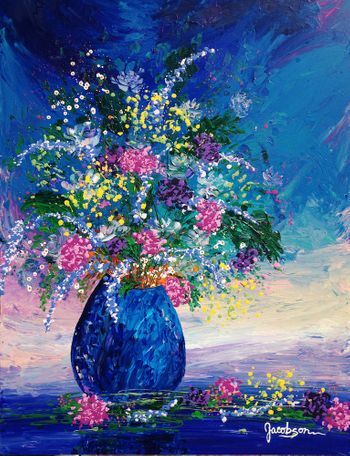 Linda’s paintings are on display now through July 4th at our UT location. Linda is originally from Floresville, TX (which translates to “City of Flowers”). Each spring, wildflowers blanket this small town in South Texas, creating an explosion of color. This became Linda’s inspiration for her artwork. Linda has been painting since the age of 14. She received her BA in 1990 from the University of the Incarnate Word with a double major in art and communications and went on to obtain her MA in 1991 from Stephen F. Austin State University, majoring in communications with a minor in both art and English. For the decade that followed, Linda pursued a career in the field of communications and journalism, but continued painting as a hobby in her spare time. 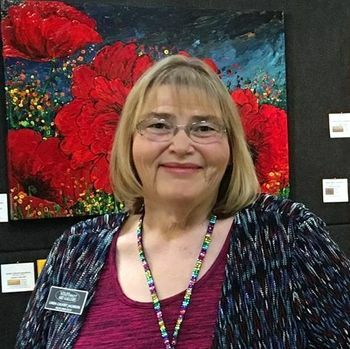 In 2002 Linda was working as Managing Editor of a local newspaper (Canyon Lake Times Guardian), and she found relief from her stressful job through painting. Focused solely on the process and therapeutic value of painting, Linda was unconcerned with the result. 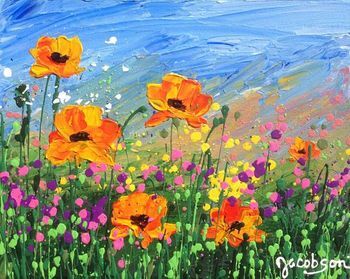 She painted in an abstract style, allowing whatever came to mind to flow from her paintbrush and onto the canvas. In 2003 Linda decided to leave her job as Managing Editor and joined the New Braunfels Art League (NBAL), which runs a co-op gallery in Downtown New Braunfels where Linda first began selling her artwork. In 2004 Linda rented a studio upstairs from the NBAL, where she continues to paint and teach art classes. 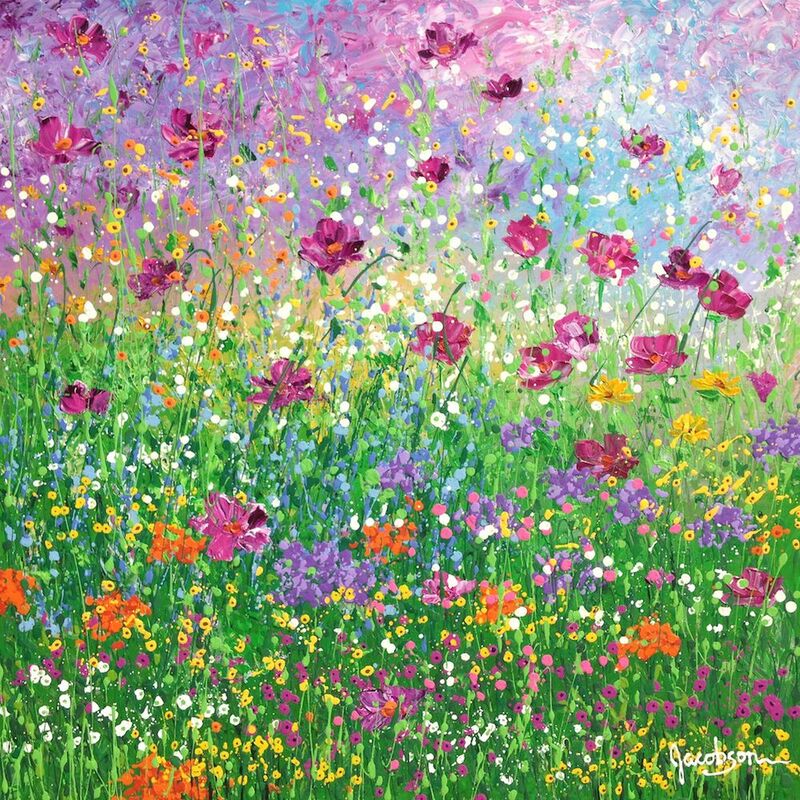 Over the past 12 years Linda’s paintings have made their way into national galleries and fine art shows across the country, and her artwork has been licensed internationally on products in the U.K., Europe, Australia, New Zealand, and even the United Arab Emirates. Though Linda has achieved incredible success through her participation in art shows and the opening of her own gallery, she is equally proud of the founding of Casa de Linda Art Studio. Casa de Linda offers art classes for adults and children, as well as a Summer Art Camp for kids. With art class frequently being the first casualty of school budget cuts, Linda is passionate about giving children the opportunity to develop their creative talents and artistic expression. Linda’s preferred medium is acrylic on canvas and over the years she has experimented with many different techniques and styles, including surrealism, expressionism, impressionism and abstract work. 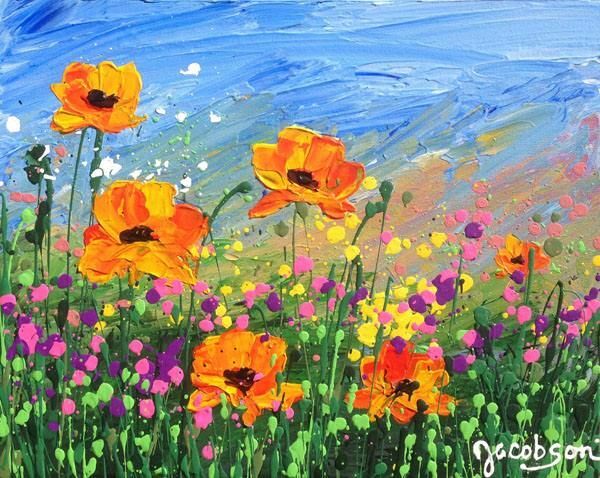 The distinctive style of painting she is well known for today has taken her many years to develop. 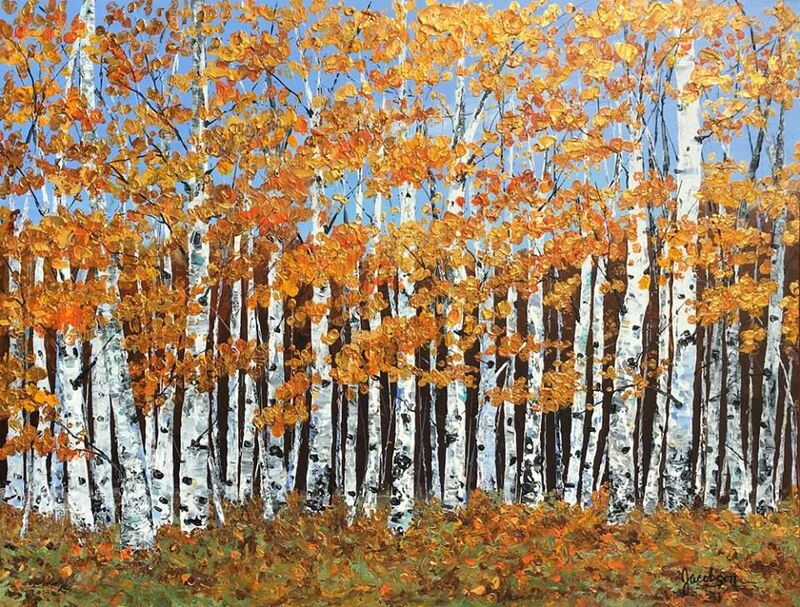 Linda’s loose, contemporary style and use of non-traditional techniques distinguishes her from those who paint more realistic landscapes. 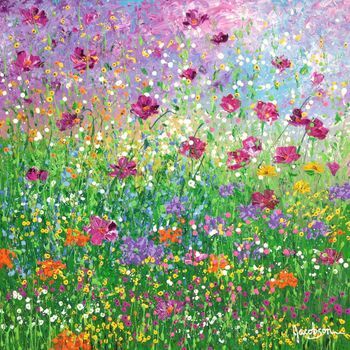 You can see more of Linda’s artwork on her website and Facebook pages: Linda Calvert Jacobson – Texas Wildflower Artist and Wildflower Art Gallery. All of her paintings at Kerbey Lane Cafe are for sale. Linda also offers in-home viewings for those who want to see what works best on their walls before purchasing. Questions for Linda? Email her at linda@wildflowerartgallery.com.